Welcome to the All Hands on Deck Challenge page. With your help, The Salvation Army Fairfax Corps will raise $15,000 to support its gospel arts and after school programs. 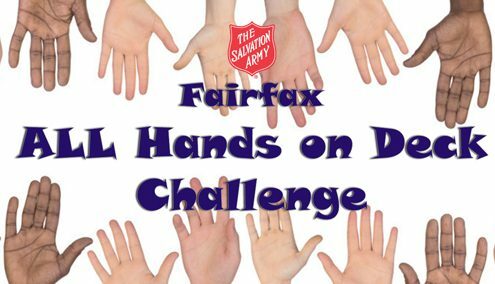 The All Hands on Deck Challenge is simple, and when you donate and accept the challenge, your donation helps kids in Fairfax to learn and grow in body, mind, and spirit. ACCEPT: Accept the challenge and create a face on your hand. RECORD: Take a video of your hand singing the chorus of the song “Happy” (Pharrell Williams) to lend a hand to raise funds. GIVE: Make a generous donation to support The Salvation Army’s after school programs in Fairfax, VA.
Click on the donate button to get started today and help us to continue doing the most good across the community.